One of the first projects I worked on soon after joining AHBE was the Cal Poly Pomona Business Administration Building, a landscape architecture project that eventually became one of my favorite projects. Cal Poly Pomona is my alma mater, so the project presented an amazing opportunity to contribute back to the school and campus. The Cal Poly Pomona Business Administration project – located adjacent to the iconic Kellogg Rose Garden, and on the site of the former Horticulture building and greenhouses – consists of three new Business Administration buildings, each designed by architects, AC Martin Partners. The formation of the new buildings was formed to create a courtyard to invite students to gather, study, and build relationships. The courtyard itself represents a physical and spatial metaphor for the various stages of business relationships: introduction, the forming of connections, negotiation, and social gathering. The outdoor spaces are where students first meet – beginning in the entry forecourt, transitioning to other more intimate and group social areas where building relationships seems a natural outcome of the welcoming environment. The geometry of the courtyard was derived from the formal nature of the nearby Rose Garden, radiating from the concentric circles of the floral garden itself, while the pathways through the courtyard are lined with vegetative swales that act as biofiltration areas, treating stormwater runoff during the wet season. Since the location of the new buildings required demolition of the existing horticulture building and greenhouses, we invited Cal Poly Pomona’s Horticulture professor to help choose specific tree species he preferred as part of the project’s plant palette, an extension and support of the horticulture program. Tree species in the palette eventually chosen included Calodendrum capense (Cape Chestnut), Acer Saccharinum (Sugar Maple), Schefflera elegantissima (False Aralia), and Maytenus boaria (Mayten Tree). I believe this collaboration between our team and the university’s Horticulture professor resulted in a playful planting design represented by an eccentric collection of plants that harmoniously work together, forming a unique botanic garden experience presented in an urban campus setting that matures and evolves every year. I learned a great deal working on Cal Poly Pomona Business Administration project – from how to layout hardscape joints, to the thoughtful process and relationship of where softscape, hardscape, and building meet – a particularly memorable and enriching first experience for a recent college graduate that showed me the process by which the conceptual became a reality. The students finished their mid-term review last week, presenting their research, inventory, and site analysis for the city of Long Beach. 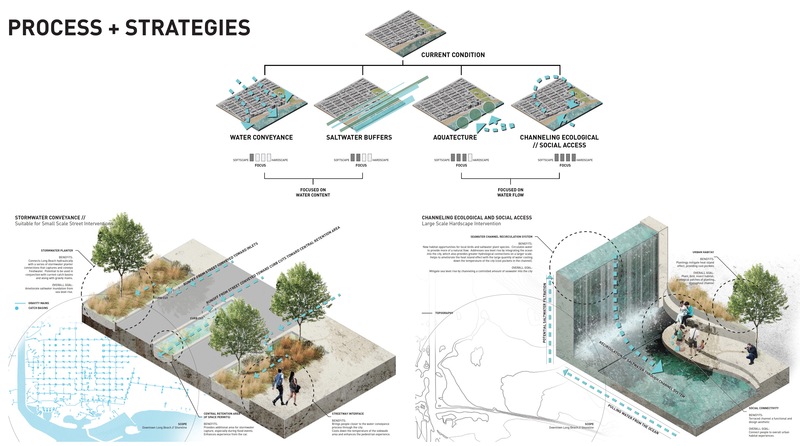 After forming into five teams, each group explored both soft and hard infrastructure strategies, as well as adaptation and mitigation tactics towards coastal resiliency. It is predicted that in 20 years our sea level will rise by 1 foot. How do we prepare our coastal communities NOW to be resilient towards this climate change? We can no longer respond with familiar strategies and technologies, but we also need to explore new solutions that goes beyond our comfort zone by imagining what resilient urban infrastructure can be. Students researched mitigation strategies such as the establishment of a living breakwater, a structure designed to shield the coastline and offshore breakwaters by slowing and lessening the impact of sea level rise. Techniques range from artificial reefs, oyster-culture, wetland restoration, and artificial tidal pools. Other strategies for adaptation considered by our student-collaborators included the creation of infrastructure to aid communities prepare and integrate rising sea level through natural system barriers such as wetlands; re-thinking our transportation infrastructure by creating canal-oriented communities was another explored possibility. 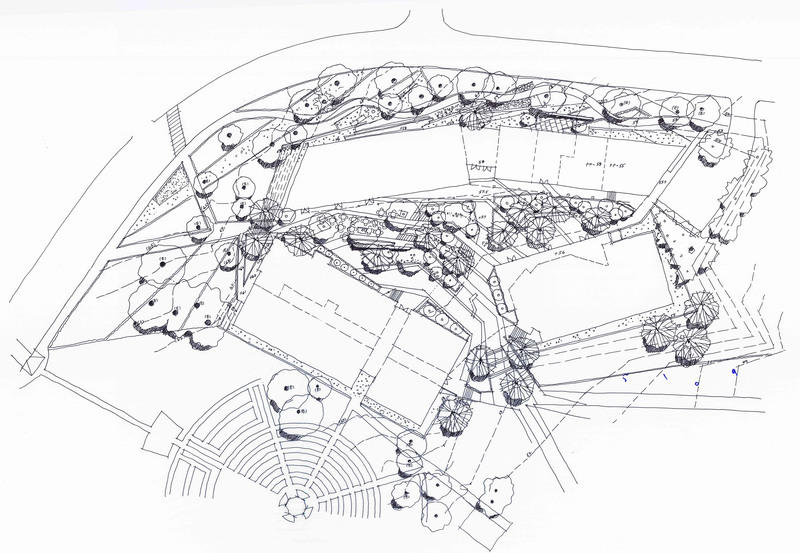 Diagram produced by our student collaborators of the Cal Poly Pomona Landscape Architecture program. See our first Cal Poly Pomona Coastal Resiliency post “Sea Level Rise and Foreseeing the Future” here.